I've set up a series of pages that walk you through the same experience that the jurors go through using a monitor to view the images instead of digital projectors. To find out how a specific show is jurying, look under jury details for that particular show. Be aware that not all shows have disclosed their jury details. When you click on the "Save This Score" button on the last page, you'll be brought back to this page. The back and next navigation you see at the top of each page are part of my web site, not the ZAPP viewing format, though it wouldn't surprise me if they didn't use something similar. I've used four of my own images for this example. A horizontal, a vertical, a square and an old booth image so you can see how different formatted images appear to the jurors. You will see that a small amount of vertical scrolling is necessary to see the entire 700 pixel square image. 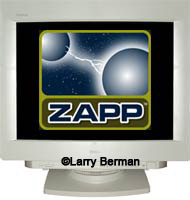 When I asked ZAPP about the scrolling, I received this answer; "You are correct that there is a minimal amount of scrolling that jurors have to do to view the entire image when it is in a monitor jury. Right now, I believe that there is no standard monitor resolution or space taken up for the images for jurors. It is something that we are considering as an enhancement for the future."